Last year I was showing a house in the boonies (defined by me as any place more than 30 minutes from my house) and I stumbled across a farm with acres and acres of blooming mums. It was quite a sight to see. I stopped in on my way home from the appointment and ended up filling my car with gigantic mums of various colors, bursting with blooms. The selection was unbelievable and pricing incredibly reasonable. Fast forward to this year. We’re approaching Fall and it’s time for me to get my seasonal plants in place. Now, just where the heck was that mum farm and what was its name? A few weeks ago I did a Google search. Ellington and mums. I came up with Johnny Appleseed’s Farm in Ellington, but based on the pictures, I knew that wasn’t it. More searches, but nothing. I was going to need to go for a drive and find it again. I looked up where I was showing the house the previous year and headed in that direction. I thought it was on Route 83 North, but wasn’t sure. About 30 minutes into my drive I came upon the place, but it wasn’t open. 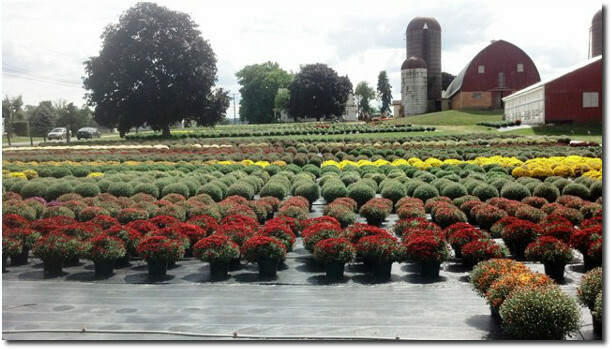 The mums were out and growing, but the small sales barn was closed and there was no sign. Hmmm, what was this unnamed place and when exactly did they open to sell their mums? Fast forward a few weeks to a slower afternoon. It’s past Labor Day, so the No-Name Mum Farm had to be open, right? Time for another drive. Jackpot! The mums were blooming, the sales barn was open. Time to pick some mums. Turns out the address is 112 West Road/Route 83 in Ellington. And there really doesn’t appear to be a name for this place. They have an Open flag out and a large sign that says “Mums For Sale,” but that’s it. You can get 10″ mums for $8 each or 5 for $35. They also sell pumpkins, corn stalks and hanging mums. Perhaps most impressive is the selection and quality. There have to be at least 60 different varieties and colors available, and they have different blooming schedules. The mums are huge and loaded with blooms. From the picture above, I was about 3/4 into the field and it runs all the way to the barn. They only take cash or check and open after Labor Day each year. Unfortunately I’m not sure of their hours. A little bit of a drive, but I think it’s definitely worth it. 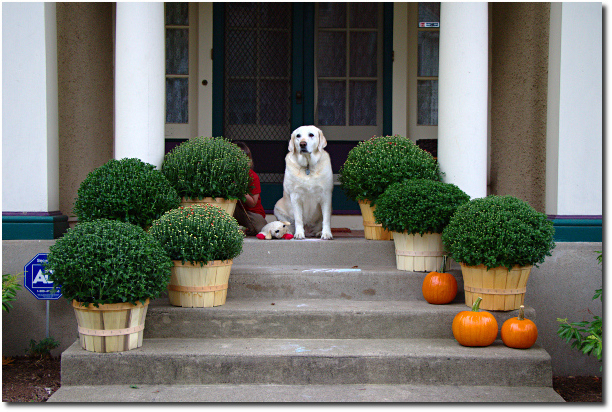 For an understanding of scale, here’s our normal sized Labrador, surrounded by this year’s mums. Huge, I tell you! Thanks for not keeping mum on the mums. My niece told me about this place a few years ago. It never disappoints, can’t beat the price for the gorgeous mums!